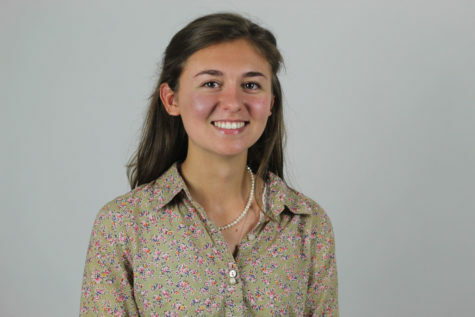 Lily Hager is a junior and has been learning how to write for the community through newspaper since the seventh grade. Her third year of The Red Ledger is also her first year as one of the Editors-in-Chiefs, along with Madeline Sanders. She’s always down to meet new people and skip the small talk. That’s why she made it a priority to double block newspaper this year- to know every staff member. Because for the past 5 years, she hasn’t just fallen in love with journalism. She fell in love with the staff she writes with, too. When she’s not in E103, the newspaper room, she’s in the band hall as one of the drum majors. You can catch her at every football game on a podium “waving her arms around,” as some people call it. It’s the little things that can make her day. Lily starts each morning by greeting her pet rabbit, Boots. She feeds two fish, Ryder and Rosy, and waters her 15 plants (and counting), all before leaving her bedroom. When she doesn’t stay up too late writing, editing or finishing homework, she may start her day early with a Bible study or delicious breakfast. As an editor, she wants to make the website the best it’s ever been. She has big shoes to fill, but she is so confident in the strength of this year’s staff. She will use each day to help provide the school with a reliable, timely and interesting publication.